A shake up in fungi taxonomy has resulted in Geomyces destructans, the fungus known to be the cause of white-nose syndrome in hibernating bats, to be reclassified Pseudogymnoascus destructans. 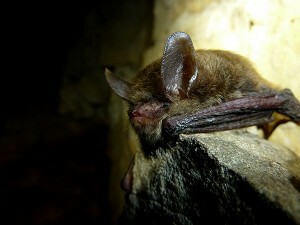 Since the outbreak of white-nose syndrome in 2006, scientists have looked closer than they ever have at the fungi in caves, specifically bat hibernacula. As a result of all their studies, a large number of new Geomyces and other similar species have been discovered. In a paper released in the journal Fungal Biology earlier this month, researchers from the U.S. Forest Service Center for Forest Mycology Research looked at the DNA sequence of these new species in an attempt to better understand the origin of Geomyces destructans and to develop better detection techniques. Their results indicate that Geomyces and friends should be moved from the family Myxotrichaceae to the family Pseudeurotiaceae. In addition, they also found that Geomyces, Gymnostellatospora, and Pseudogymnoascus are distinct genera under the Pseudeurotiaceae family. In developing the placements, the genus Geomyces has now been restricted to species with a genetic lineage to the type species, G. auratus. Due to its lack of such a connection to G. auratus, Geomyces destructans has been moved to the genus Pseudogymnoascus, giving it the new title of Pseudogymnoascus destructans. Furthermore, the discovery that P. destructans is isolated from other species included in the study provides further support to the idea that it is non-native and invasive species in North America. This is only the beginning, as more sampling is done in other regions of the world, scientists will be able to better understand the evolution and biogeography of this important and diverse group of fungi.